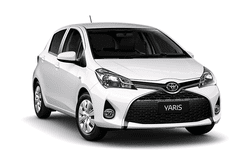 The Toyota Yaris Auto is a decent bet if you want lots of space and luxury kit for an affordable price! It comes will standard safety features, great power and performance, good fuel efficiency, and the perfect blend of style and comfort. This model is sleek and stylish while also offering great control and speed with a powerful engine that fits into a small yet charming package. It has great millage rates and is packed with all the latest features and accessories you would come to expect from a luxury vehicle. With seating for 5 and plenty of easy access cabin and cargo space, the Toyota Yaris Auto is sure to be a must-have for many drivers. Check it out for yourself today!